The view of the American Falls, located in the State of New York in the USA, is beautiful from the Canadian side of the Niagara River at Niagara Falls in Ontario, Canada. 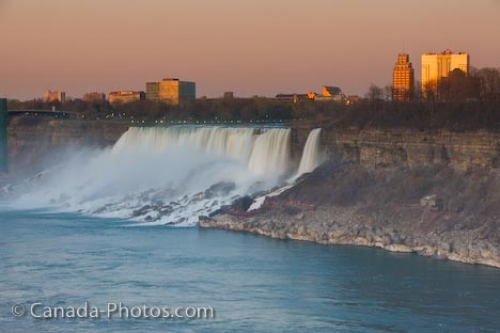 As the American Falls drop from a height of between 70-100 feet, they thunder into the Niagara River which connects two Great Lakes, Erie and Ontario. The rock pile at the base of the falls changes constantly making the height of the waterfall different all the time. If they were measured from the top of the falls to the surface of the Niagara River, it would be 188 feet high with a width of approximately 830 feet. Picture of the sunlight reflections off the buildings as the American Falls crash into the Niagara River in New York State. ... To reach the State of New York in the USA from Ontario, Canada, one must travel across the Rainbow Bridge, an international steel arch bridge which crosses over the Niagara River gorge. The best view of the American Falls is from Ontario, Canada where platforms overlook their beauty and the skyline of New York State.